This article explains how to send an email notification to your customer when updating an order. 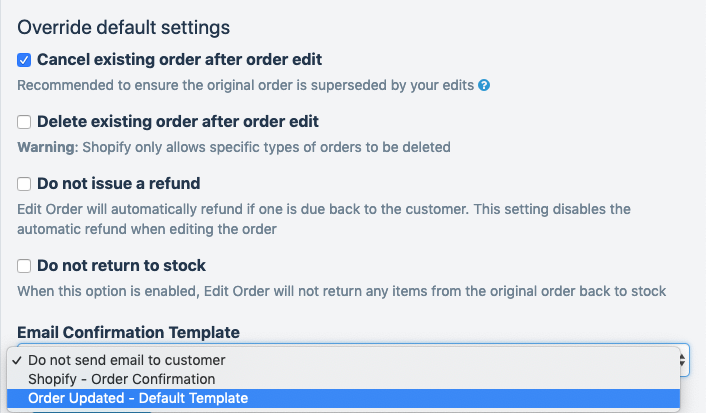 Change the option to "Order Updated - Default Template"
When you save your edits, Edit Order will send an order confirmation email letting your customer know that their order has been updated. Click Advanced Settings in the blue banner in the upper right hand corner. An easy way to get familiar with these options is to create a test order using your own email address so that you can then edit and test the results.